WHAT I LEARNED FROM MY FRIEND, MELISSA. It's crazy to think that it's been one month since my friend Melissa passed away. Grief as a way of coming in moments not expected, where all of sudden, I find myself crying. I think of her often, and how so many miss her too, especially her family and husband. If you don't know anything about Melissa, she was diagnosed with Breast Cancer a few years ago, after treatment she started a shop called Hope 25. 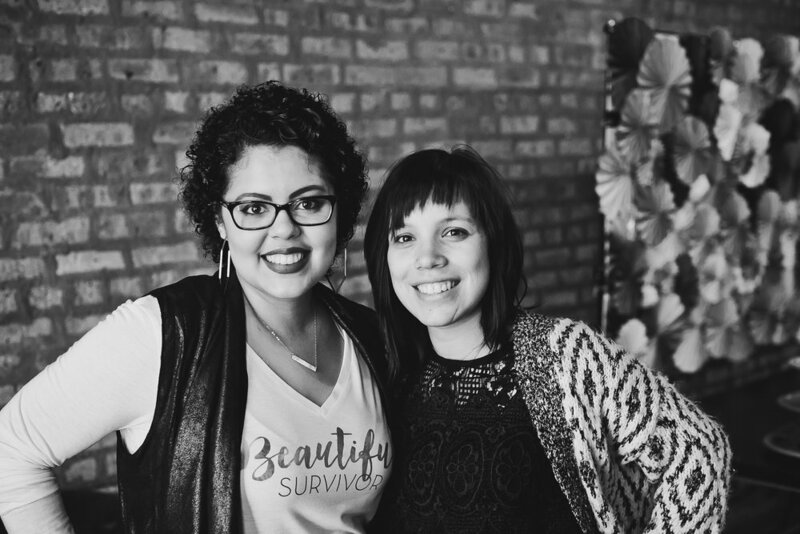 Her dream was to grow her photography business, and continue to inspire the cancer community through her inspirational t-shirt designs, and then her Breast Cancer Metastasized rather quickly taking her independence. Our friendship started at the time of her first diagnosis. We first connected through Facebook, and then started getting together for coffee dates, and if not coffee then it was tacos. We talked about photography, family/marriage, Jesus, and how we wanted to impact the world. We were also accountability partners at the beginning of 2017 for our businesses, and would text each other often. Needless to say, while we weren't friends for lots of years, she was a very dear friend to me and greatly impacted my life. I'm grateful that she allowed me to walk along side her as she battled Breast Cancer. As a way to celebrate her life, I wanted to write a blog post on how Melissa left an everlasting fingerprint on me. So, here's 6 things she taught me. HOW TO PUNCH FEAR IN THE FACE. This was her mantra. When she was first diagnosed, she told me that this was her season of punching fear in the face. I saw this girl use her story to help and inspire so many. She didn't allow her insecurities, or fears to stop her. While she may have been soft spoken when meeting new people, she was bold and courageous on social media. Now punching fear in the face didn't mean she didn't have fears, because she did. It was through her vulnerability that encouraged so many to know that it's okay to have fears, but to stand in truth, and to overcome those fears. TO OPEN UP MY HEART FOR FRIENDSHIP AGAIN. I went through a major loss of friendships before Melissa entered my life. Her friendship helped me to open up my heart, and allow myself to befriended, and loved. Melissa was a great listener. Sometimes she'd let me just talk, while she listened. One thing she didn't want was to constantly talk about her cancer and treatments. She wanted to feel normal, and did that by wanting to know what was going on with me, which was extremely hard for me, but wanted to honor her wishes. Other times, we just watched random TV shows together, like CatFish. TO JUST GO FOR IT. When Melissa shared her shop idea with me, she was a little hesitant in how to do it and make it all work, and then I kid you not, a week later she launched her website, and Insta. I was like "whoa".....She just went for it. She may have not had it all figured out, but she was going to, and that determination led her selling over 1,000 t-shirts. TO LAUGH AND DANCE MORE ESPECIALLY WITH THOSE YOU LOVE. Melissa had the sweetest laugh, she did this thing with her nose where she would scrunch it and giggle. She taught me to laugh and be silly. I also loved watching her IG stories when she would laugh and dance with her husband. It was so inspiring to watch the love she had for him, and for her family. Melissa had this amazing connection with her family. She loved spending time with her mom, and sometimes when we went to events together, her mom would come along. I loved it! Their bond was truly special, but this wasn't just with her mom, she had this bond with her brother too. As a matter of fact they did their photography business together. I loved watching how her family loved each other so well and deep. I'm sure I could write a ton more, but I end with this! Melissa, I miss you friend. But I can imagine you dancing and laughing with Jesus right now, and that gives me peace, knowing that I'll get to see you again.